This was our first year with Grace in competition dance with Eau Claire School of Dance. I thought that now that the season is over, it might be a good idea to write my thoughts about each of the events they danced at. I summarized in the introductory post what you can expect to find. The first competition of the dance season was Hall of Fame. Being the first competition for all the girls in Grace’s class, they had a lot of energy. I’m not sure if all that energy was excitement or nerves (or both), but it was awesome! The high energy level definitely showed in their dances!! It was lots of fun!! Hall of Fame was held in downtown St. Paul, at the Roy Wilkins Auditorium. It was strange to be there again. I had been there for events in the past (dog shows and kung fu tournaments), but not since it became part of the Xcel Energy center. As a venue, it was very nice, but because of the size, it made finding things (especially dressing areas) difficult. It was also very dark once you got to the area that competition was held. That wasn’t necessarily a bad thing, just unexpected. I didn’t like having to pay for parking, but I parked a couple blocks away, so it was only $5. My Mom ended up having to park at a meter, and kept having to run out to feed the meter. I thought meters were free on weekends – guess not. As a parent trying to watch the dancers, it was very frustrating! I can’t imagine it wasn’t frustrating for the judges either – they were going in such a random order. It was not even close to the order printed in the program, or the times they were scheduled. Our girls danced their first dance over a half hour early, and one parent missed it, because she was in line to get donuts and juice for her other children. I heard many parents in the hallways (from other schools as well) arguing over the phone that they were sorry the other person had missed it – they didn’t know they’d be going so early. Luckily, everyone who came to watch Grace (Dad, grandparents, aunt, brother, and cousin) all came super early. Figuring out which dancers were in which division was difficult too, due to the randomness of the order. Complaining aside, there were some things I really liked about it. There was a great selection of both kids and adult sized shirts, sweatpants, shorts, etc. available for purchase. Their programs were nice too, but felt a bit pointless to spend the money on, since following it was so difficult. Their prices for items were reasonable, and Grace ended up with a WAY cute shirt! Watching all the dancers, all I can say is WOW! There was some GREAT competition!! There were some really good dancers who had obviously been dancing together for quite a while. Some of the studios we saw with several placement awards were Larkin, Lake Area Dance, and Energy Dance Center to name a few. We already knew we’d likely be moving to MN, so we paid close attention to the other studios to see where Grace might want to go next year. I liked the way the judging was done. Every class was given a ranking based on their overall score. The rankings were: High Silver, Gold, High Gold, or Platinum. Each of the girls was given a pin with their ranking. They also had placement awards (of course). The thing I liked, is that there were other awards given out. Our girls won a costume award for Pink Panther. Grace and another girl, Laura went up to accept the award. They were SO excited (and, I think, a bit surprised). I had brought Grace up to the balcony to see her Dad and other relatives that had come to watch her dance. There were signs up there asking not to take pictures, but I did not see them on the main level at all! I took a couple of pictures during their first dance. My Mom and I were sitting up at the front, and I got a dirty look from one of the judges. Oops! Later, they made an announcement asking people not to take pictures. At a later competition, I was talking to some random other dance mom, and she told me that often, judges will dock points for people taking pictures during a performance. I wish I had known that earlier! I hope that my taking a couple pictures didn’t hurt their score! Speaking of pictures, apparently, there were professional photographers taking pics that you could later purchase from their website. I didn’t have a clue about that, as it was not advertised anywhere that I could see. I discovered them by accident when I was checking out another dance school’s website after the last competition! What a cool feature – it’s fun to go back and look at the action shots from each performance. 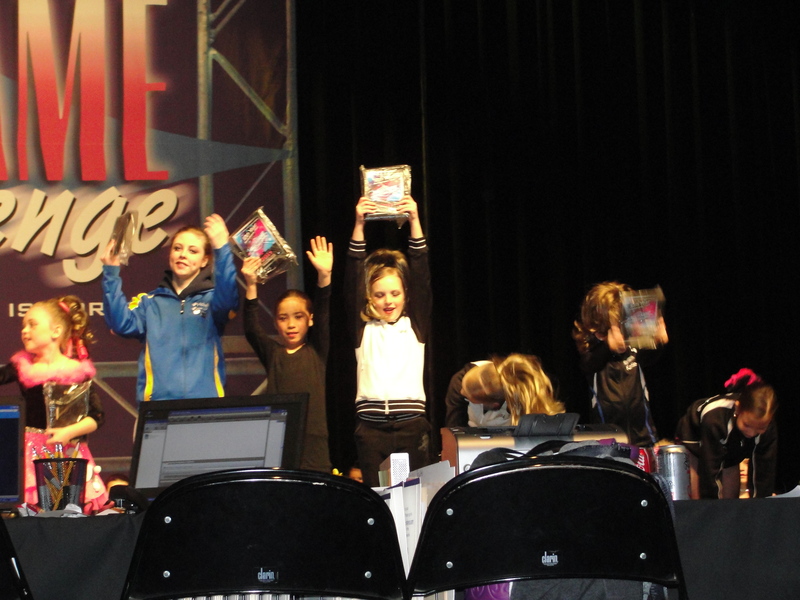 To summarize, Hall of Fame had a great energy level, was fun for the girls, and had some fun “extra” judging awards. The girls did great!